Fifty-one Illinois ITE members and guests were able to attend this year’s Annual Banquet on January 25th at Union League Club in downtown Chicago. The banquet each year is a commemorative event for the section to honor student awards, section awards, and to install the new board. We were honored to have the 2018 Midwestern District Director & International Board of Direction, John Davis, provide an update on the Midwestern District of ITE and to install the new Section Board. Ryan Jacox of TranSmart/EJM was awarded the Outgoing President Award for his contributions to the Illinois Section. The Outstanding Member Award went to Jenna Brose of AECOM for her efforts in establishing IL-ITE as a 501(c)3 organization this year.. Randy Laninga, a former President of the Illinois Section, was honored with the Past Presidents’ Award for his contributions to the transportation engineering profession in Illinois. We also recognized Patrick Jordan for his contribution to ILITE as the ongoingITEms Editor. This year’s Undergraduate Scholarship was presented to Cassandra Reineke of Illinois Institute of Technology. This year’s Graduate Scholarship was presented to Ali Shamshiripour of the University of Illinois at Chicago. 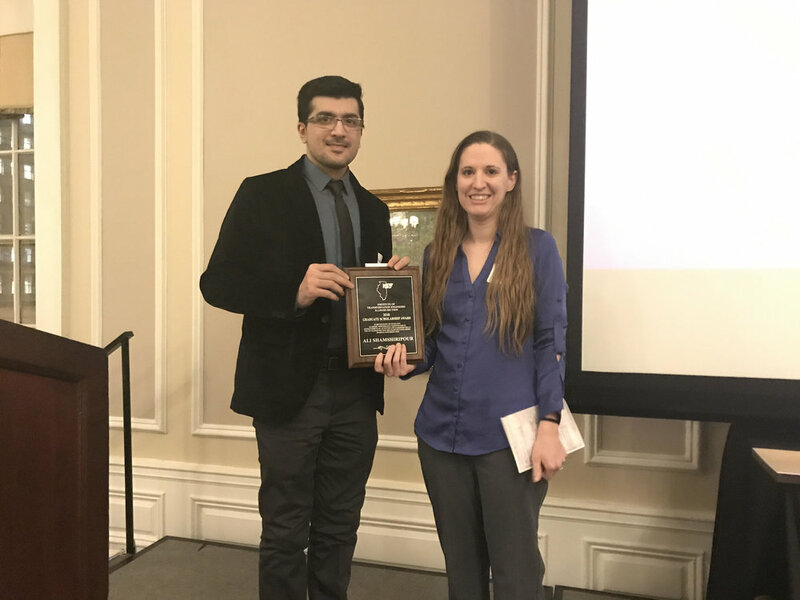 This year’s Student Paper Award was presented to Amir Bahador Parsa of The University of Illinois at Chicago for “Real-time Accident Detection: Coping with Imbalanced Data.” Congraulations to Cassandra, Ali, and Amir for their outstanding work in 2018! A special thanks to the Illinois ITE 2019 Sponsors! Silver: Baxter & Woodman, Dama Consultants, Gewalt Hamilton Associates, Inc. The Illinois Section of the Institute of Transportation Engineers (ILITE) is excited to once again offer an opportunity to sponsor the section for 2019. Through our sponsorship program we offer unique opportunities which will benefit your organization and help further ITE's goals for 2019. We're reaching out to you to ask that your organization partner with Illinois ITE in advancing these goals. In 2018, ILITE completed another successful year with the section sponsorship program, and expanded to many new corporate partners! Corporate sponsorship continues to be paramount in ensuring that meaningful programs and the scholarship program can continue. ILITE prides itself on its ability to provide scholarships to students pursuing studies in the transportation field, and with the help of our corporate sponsors, our student scholarships continue to thrive. ITE has long striven to be an organization which promotes leadership, networking, and education. Each year, our officers and committee volunteers spend countless hours to unite members of your organization with engineers and other transportation professionals in the spirit of these objectives. The sponsorship summary and form detailing benefits associated with the different levels of financial support can be found in the link above. To ensure you receive all listed benefits for 2019, we request that you send in your completed form by Friday, December 28, 2018. Additionally, in the event that levels of sponsorship fill up, we will determine order by date of response with completed form. We hope that you will consider joining the ILITE team in 2019. If you have any questions, please contact the ILITE Sponsorship Chair, Katelyn Bleach, at 312-612-7287 or IllinoisITE+sponsorship@gmail.com. The Illinois Section of ITE encourages public agencies to participate in the 2018 Traffic Signal Benchmarking Self Assessment. The Self Assessment will be the basis for the Traffic Signal State of the Practice Report which will characterize the state of the infrastructure and the organizational practices that support the management, operation, and maintenance of the signalized intersections. The data and report that result from the survey and case studies will help to identify opportunities to improve support for traffic signal systems. This project is being led by the Institute of Transportation Engineers in collaboration with the National Operations Center of Excellence with support from the Federal Highway Administration. View the recording of the April 4 web briefing to learn more about the Self Assessment, its history, objectives, and the underlying basis for the questions. The Self Assessment must be completed by April 30. Illinois ITE attended the 7th Annual STEMapalooza Expo hosted by Girl Scouts of Greater Chicago and Northwest Indiana. This event occurred on Saturday, March 24 from 10:00 am to 2:00 PM at the Friendship Center in Country Club Hills. 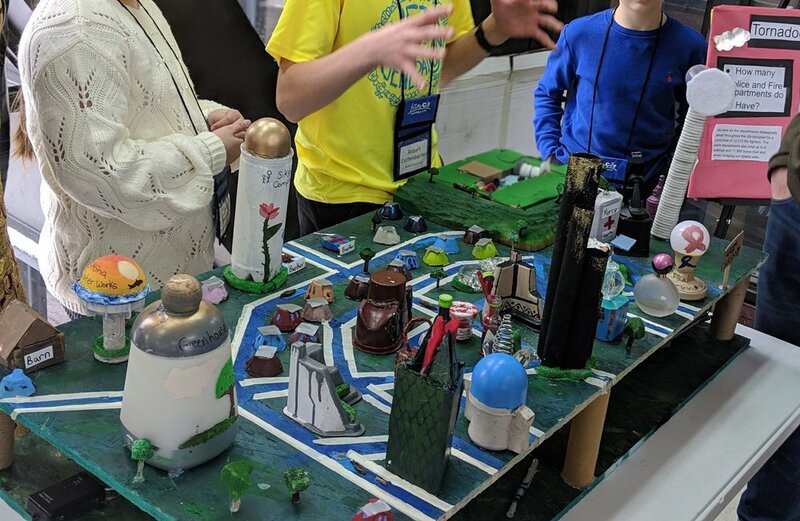 The goal of STEMapalooza is to inspire girls to explore the fields of Science, Technology, Engineering, and Math (STEM) by providing hands-on activities for the 400 girls who attend. ILITE has collaborated with Girl Scouts for the past few years and hopes to continue inspiring young girls to pursue STEM subjects. Illinois ITE provided laptops with the traffic control game “Gridlock Buster” available to play. Gridlock Buster is an online traffic control game developed by the University of Minnesota and applies concepts vital to traffic engineering. The game incorporates the concept of delay and queue in a fun and easily understandable way. Players must control the traffic signals to ensure maximum capacity through the intersection. Illinois ITE was able to explain the role of traffic engineers to both the Girl Scouts and the attending parents. Illinois ITE would like to thank the organizers of this fun event and looks forward to future collaborations with the Girl Scouts of Great Chicago and Northwest Indiana. Thank you to ITE board members Josh Harris and Monica Shei and ITE member Bryce Wegner for volunteering for this event!